Welcome to Radianta, a southern California based info-tech intelligence specialty group, providing communication management and security network integration solutions, nationwide. Radianta came to fruition when the need for IT communication solutions were pertinent in the Medical, Commercial and Governmental arenas. Radianta emphasizes greatly on its ability to bridge the technology gap for real-time, real-information alerting, when communicating the right message is crucial. 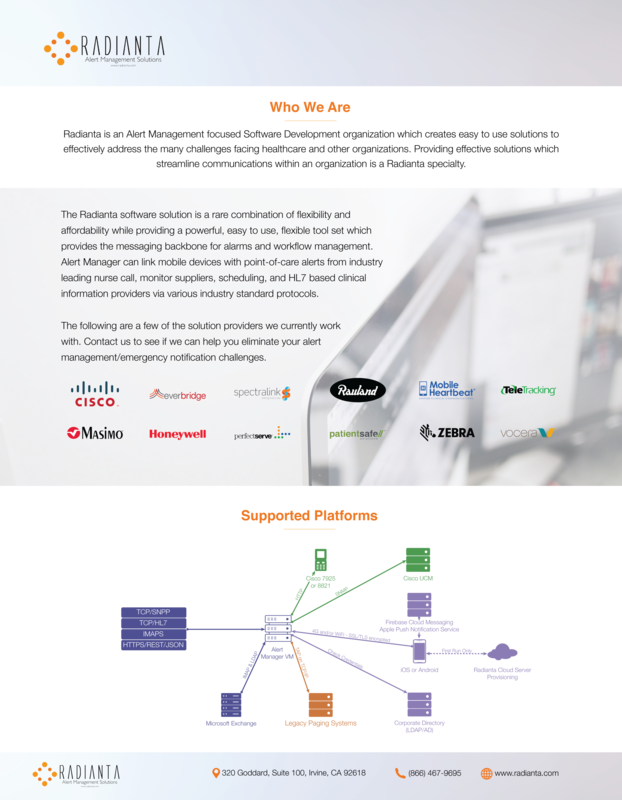 While Radianta is well known for its Radianta Alert Manager, software and integration solutions, Radianta has developed a pertinent security technology solution and app, known as Radianta Emergency Connect. With the unfortunate security threats and terrorism happening too often than not, Radianta saw the necessity to create Radianta Emergency Connect security system, as the solution to mitigate, report, and alert the right parties when real life threats are present. Radianta products are optimal solutions to any establishment with the mission to secure and streamline all communications. Our goals are to provide you with best quality and most effective communication solutions for today’s technology standards. @ 2016 Radianta. All Rights Reserved.